The quality achieved in this way forms the ideal basis for a Premium Caipirinha - Cut a lime into eight pieces, place in glass, add 1-2 teaspoons of cane sugar, squeeze out the lime juice with the Pitu pestle, add 6cl of Pitu, fill the glass with crushed ice, stir and enjoy! A perfect caiprinha for me has to hit the nostrils, via the back of the mouth. The tongue enjoys the lime/sugar blend, while the cachaca is felt in the nose. No matter how much Pitu I mixed, I couldn't get it to work. 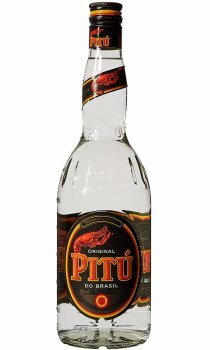 For want of a better explanation, I'll keep it simple - Pitu is too clean a taste, it has no attitude and no edge. I much prefer Velho Barreiro, far better in a caiprinha. Some real plus points, but considering the heritage, there are better to choose from. A quite tight, acidic nose which is luckily dispersed upon tasting neat. When used in a Caipirinha it combines very well with the lime, but somehow fights the sugar, creating a disconnected, muddled drink. Price is hard to beat and overall what you should expect from a world renowned brand.